Led by Azure, Microsoft’s cloud businesses helped the company reach a strong 2018 second quarter. Azure revenue grew 98 per cent during the quarter, on par with previous quarters, and while Microsoft didn’t reveal the exact revenue the public cloud platform is contributing to the company, Microsoft CEO Satya Nadella said the success of Azure and its other cloud services is an indication of the company focusing on the right trends and markets. “Every CEO I talk to is keen to start their transformation journey by empowering their employees in creating a modern workplace. They want productivity and collaboration tools that deliver continuous innovation and do so securely,” Nadella said during an earnings call. According to Microsoft, Azure premium services revenue grew triple digits for the 14th consecutive quarter. 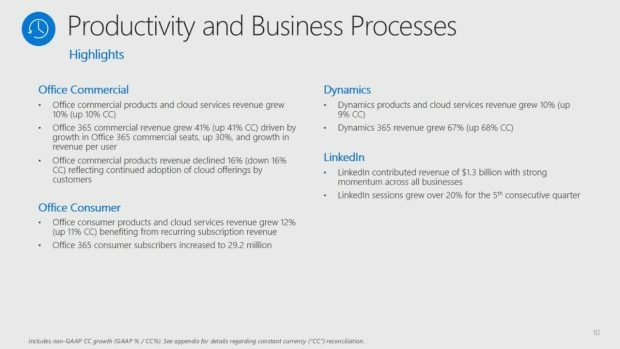 Dynamics 365 revenue grew 67 per cent year-over-year. Microsoft’s Office 365 consumer subscribers jumped to 29.2 million, a slight increase from the prior quarter’s 28 million figure. Server products and cloud services revenue grew 18 per cent. Enterprise services revenue increased by five per cent, driven by Premier Support Services. Microsoft is also going to focus more on voice, Nadella said. The company will install dictation capabilities across multiple apps in Office 365 and Cortana will also make its way to Outlook’s mobile app. Additional investments to Windows 10, when it comes to security, have left a positive impact on businesses, many of which were shaken after Spectre and Meltdown, Nadella added. The biggest hit against the company this quarter was a $13.8 billion net charge related to new rules within the U.S. government’s Tax Cuts and Jobs Act. Our thanks to investment research platform Seeking Alpha for the transcriptions from Microsoft’s Jan. 31 Q2 earnings call.